the 29th of December 2017 to the 8th of January 2017. URGENT SERVICES ARE AVAILABLE FOR COMMERCIAL AND ASSISTANCE. We are proud to announce that also in 2017 we will be present at the IBC2017 exhibition in Amsterdam. We planned and proposed two possible solutions about tunnel broadcast which have in common the double bridge combiner but differ in the type of apparatus. If you are interested in more details, please visit the dedicated page by clicking to this link. If you want to know something more about us but you don't have enough time, take a look at our company profile in short! Here you will also find out where all our departments are located. The new presentation about the TV Products called "ECO SERIES" is available now. Click on the attached document to download the presentation. CHECK OUT OUR NEW "BLUE SERIES"! The new Blue FM Transmitters Series sets ultimate features by the evolution of RF technologies. The BLUE technology represents the new set of innovative ideas implemented by "CTE Digital Broadcast" both for TV and FM transmitters: energy saving, small footprint, compact design, low operating cost, long-life duration are the most important benefits granted for a more sustainable broadcasting. 31 May - 3 June 2016, Singapore. 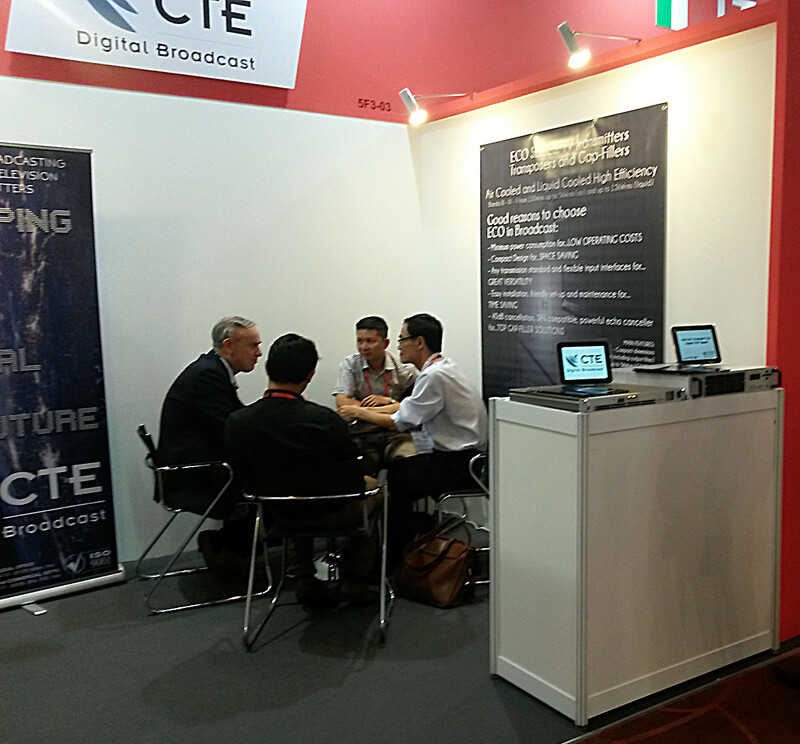 We participated with our stand at the trade fair "Broadcast Asia 2016". There was a great interest in our products and we were very satisfied. thank the organization and see you next year!